The City of Gold Coast unveiled the winning design for the $300 million precinct plan this week, awarding it to the architects behind the Melbourne Theatre Company’s Southbank Theatre and the National Museum of Australia in Canberra. 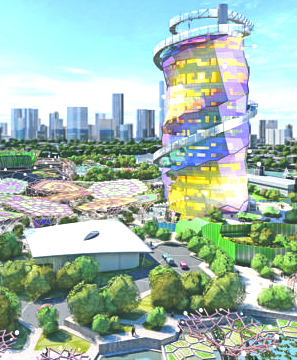 The 14-story helical design will feature the central tenets of all the great artistic arenas; a water slide, basketball courts and bungee-jumping experience. There will also be some artworks sprinkled throughout the site dubbed “Guggenheim Gangnam Style” by Gold Coast Mayor Tom Tate. The precinct will feature tree-lined boulevards and a 10,000 seat amphitheatre. Mr Tate says he expects the site would get a work-out during the 2018 Commonwealth Games, to be hosted in the city. “It’s for the whole family,” he said.